In the coming year O.F. Mossberg & Sons will celebrate their centennial anniversary of making quality firearms. They’ve come a long way from their modest beginnings of building .22 caliber pistols in a small rented space in Connecticut, to delivering one of the most reliable and best selling shotguns available today. The Mossberg 500 series of pump-action shotguns is now in their 58th year of production and is showing no signs of slowing down. The original Model 500 designed by Carl Benson had first been introduced to the public in 1960. However, its reputation as one of America’s most popular shotguns was not instantaneous by any means. Mainly because patent laws prevented Benson from originally building the action as strong as he would have liked. Remington held the patent on the dual action bar system for a decade after the 500’s introduction, leaving the early Mossberg’s to use a vulnerable single action bar system. The Remington 870 was the hottest shotgun on the market at the time and beginning to surpass the Winchester Model 12 in sales, largely due to the manufacturing cost and the retail price difference between the two. Mossberg on the other hand was able to build their guns at a much more competitive price, so as the Model 12 headed for retirement, the 500 began filling that competitive void. Mossberg teetered on the brink of giving the Remington a real run for their money. However, that single action bar was weak and presented problems with bending and even breaking, so pushing the Remington 870 aside to become a formidable competitor wouldn’t come easy. Consumers wanted the affordability, but also required durability and performance. The bad news for Remington was that the patent that had given them the edge in quality expired in 1970. The change to the double bar design was made to the Mossberg 500 immediately, hence solving any problem they had with the weaker functionality. Since then, the 500 has been made available in many different sub-models and configurations, and Mossberg sold nearly 10 million guns. Among some core features that made the 500 a real contender was its ambidextrous safety, which is mounted on the top rear of the receiver. In addition, the safety location appealed to left-handed shooters, and worked out perfectly for those families that needed an ambidextrous shotgun for more than one sportsman. Another feature was the receiver itself, which is constructed from lightweight aluminum and has kept the 500 nearly 2 lbs. lighter than the 870. All these years later, the battle for the top spot of quality, yet affordable pump shotguns, still comes down to a choice between Remington or Mossberg. Each continues to hold their loyal following while introducing variations that attempt to satisfy the many niche markets. Although both have risen to meet the advancements of the other, Mossberg has been pretty much the leader in versatility. Their Bantam and Super Bantam models were the first to cater to those consumers looking to purchase a pump shotgun that could grow with their young shooters. The Super Bantam also features a shorter distance to the forend, making it easier for smaller folks to comfortably cycle the action. A few years ago Mossberg stepped up their game by introducing a system that took the ease of assembly and versatility to a whole new level. The Mossberg Flex is possibly one of the most versatile commercial shooting systems ever invented. The 500 Flex became the jack of all trades of shotguns. Though Mossberg didn’t limit this technology to the Model 500 series, its creation is somewhat of a game changer for shotgun owners. 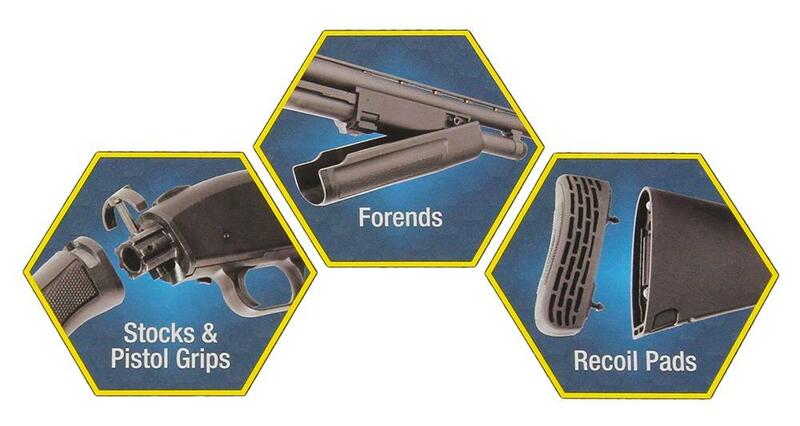 With their patented Flex locking system and considerable amount of accessory components, the modular Mossberg shotgun can be whatever the shooter needs it to be. It is no longer just the difference in the size of the shooter that can be adapted to, but the use of the gun for any purpose. Without the need for tools your turkey gun can quickly be turned into a short barrel tactical weapon, a slug gun, or whatever you need. All by simply releasing a few flex connectors and changing the stock, recoil pad, or forend. Their barrels have always been a breeze to swap out, but now with the Flex system you can put together a shotgun for any task, quickly and easily. It’s not that we feel the 500 is any better than the 870. In fact, it is pretty exciting that the world’s top two pump shotguns are both American made. Both, as we mentioned, have their loyal shooters and many of which would probably jump at the opportunity to argue the selling points in favor of each. But the purpose here is to highlight the Mossberg, so we are going to give a bit of a one-sided story. If you happen to be a Remington person, please just deal with the topic for now, we will surely give the 870 a fair shake in a future article. So what features help make the Mossberg 500 the more desirable shotgun? Well, we have already touched on the safety, its versatility and weight, so let’s talk about some other factors that make this tough shotgun stand up better to the abuse of a typical shooter. First, the double extractor system is more reliable than the 870’s single extractor, and its raised lifter makes it easier to load. The Model 500 slide release is perfectly located at the rear of the trigger guard, and it also has a screw retained ejector, which makes replacing it a cinch. The last thing to consider is price , and the 500 consistently sells for a few dollars less than any comparable 870, while still offering all the functionality and durability one could ask for in a pump shotgun. Though this, of course, can fluctuate based on the retailer and manufacturer promotions. Also, did you know? The Mossberg 500 is the only shotgun to pass the U.S. Militaries 3443 Mil-Spec testing. The 590A1 variation with a heavy walled barrel, metal trigger guard, safety button, and heat shield was put through the tortuous military testing. The shotgun was evaluated with 3,000 rounds of 2-3/4” OO Buckshot ammunition in the areas of target accuracy, endurance, abuse and rough handling, parts interchangeability, and heat shield effectiveness. Today both Mossberg and Remington guns are used by military and law enforcement agencies, but only Mossberg can boast the survival of the Mil-Spec testing. There are a few other final accolades that Mossberg could brag about, if they were so inclined. In 1988 when the hunting industry was on the verge of banning lead shotgun loads and replacing them with the steel-shot that is largely used today, Mossberg wanted to alleviate any protest from sportsmen by providing them with more power well in advance of the regulation change. So they introduced the 12-gauge 3-1/2” Magnum round, which would undoubtedly allow the ammunition to perform well in the field regardless of any change to the projectile material. Of course shooters would also need a shotgun capable of chambering the longer shell, so a 500 was the first to be built for the task. Finally the thing we can appreciate most about Mossberg as a company, is that they are the oldest American Firearms Manufacturer to remain family owned and operated, and that is no small feat. Though they had built their guns in Connecticut for more than ninety years, anti-gun rhetoric was growing among politicians in the Northeast, and it could have potentially threatened their future. So rather than go the route of other gun makers and shift their production overseas or sell out to a foreign entity, Mossberg simply relocated their manufacturing facility to the gun friendly State of Texas. They maintain their headquarters in Connecticut where the battle to preserve the 2nd Amendment continues, while they continue to deliver a product that is 100% Made in America.